Shop Shure SM48S With On/Off Switch Handheld Vocal Microphone from AMS and enjoy Fast & Free Shipping. Featuring an on/off switch, the SM48 handheld vocal mic is a true cardioid with a smooth response! Unidirectional and rugged design, the SM48 is a great road microphone that will bring your performance to great height. The Shure SM48 is a dynamic microphone by maintaining a true cardioid pattern throughout its frequency range its ensures a higher gain before feedback and superb rejection of off-axis sound. 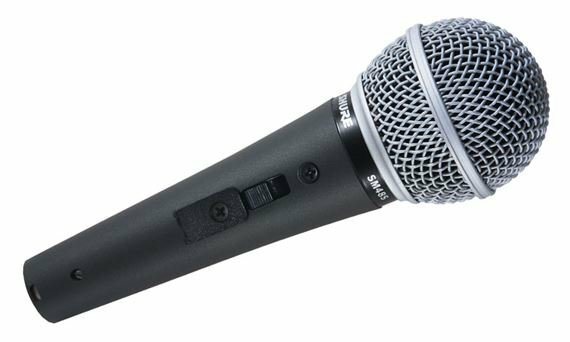 Ideal for lead vocals, backup vocals, and spoken word applications, the Shure SM48 was tailored to the frequency response of the vocal range. You cannot go wrong with Shure quality microphones. Love the deep and full sound, even from this economical model. It's a Cheaper alternative that the SM58. I just bought 2 of these mics with cables and stands. These mics are quality made, sound great, the stands are also much better than I expected. I don't think you can beat it. I bought this mic as a low cost switchable backup mic in case my main SM58 ever failed. This mic though fairly responsive has a lot of handling noise; very sensitive to taps and finger thumps. If it never leaves the mic stand it will be ok. It is rock solid and the switch can be locked in the on position if needed with a few turns of a screw. I think this little Mic speaks for itself, after all these years I've owned one and it's still working and reliable! All of my Shure mics, Beta 58, and on, have delivered great sound and have never let me down. Awesome and very reliable product! Thanks Shure! !